When was the last time you saw a post on Facebook titled something like this… “What country suits your personality”, “Do you have an entrepreneurial mindset” and many, many others. People love taking quizzes, sharing their results and comparing results with others. This is why quizzes are great to use as a lead magnet and grow your email list. But how does one use a quiz to get leads? 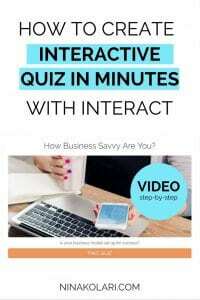 Recently I became a partner with TryInteract.com who offers quizzes, polls and giveaways. I had always wanted to use these for my business but never really got around to creating them. So when Interact contacted me to become their partner I was overjoyed! I have been testing the site for over a week so far and I’m in love! I am kicking myself that I waited so long to implement quiz as a lead magnet… I knew I should do it but procrastinated. My experience is only with Interact so can only write about that website. There are many sites offering similar services and you can find those searching on Google. You can take my quiz clicking here. Like mentioned earlier people love to take quizzes. They also love sharing their results and getting friends to take same test to compare the results. This means one person takes the test, shares is and asks friends to take same test so that they can compare their results and talk about it. Quiz takes literally do the work for you! No freebie, checklist or book will do this for your email list. Sure all those are helpful and will grow your list, but not shares as much as quiz results. With a quiz you can also segment your followers based on their results. For example, running an online business, a quiz about running one tells you in which state your prospect is at so you know exactly what kind of content to send them. Someone who is just starting has totally different needs than someone who is already a year in and making money. The best thing about Interact for me is that I don’t have to re-invent the wheel, so to speak, as they have hundreds of quizzes ready to be used. Saves hours and hours of time as I can use template and upload it to my website and wait for people to sign up. Of course template is quite general but for most businesses template is more than enough. What I did change was the results page and added links to blog posts, course and related content. I did take two template quizzes and adjusted the quiz itself to fit my audience. That was easy to do on Interact!